"As my trade mark, I continued to use the rampant horse that had been used on the cars of the old Scuderia Ferrari. The story of this rampant horse is a simple and fascinating one. 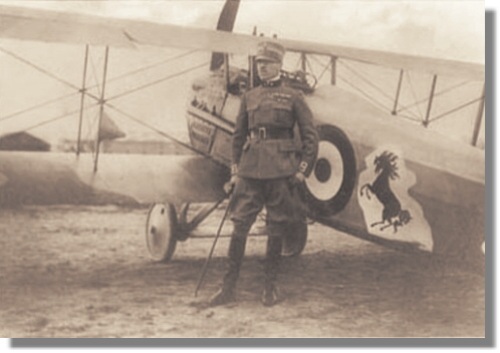 The emblem was emblazoned on the fighter plane of Francesco Baracca, the ace of World War I, who was shot down at Montello. In 1923, when competing in the first Circuito del Savio, at Ravenna, I made acquaintance of Count Enrico Baracca, the hero's father; as a result of that meeting, I was subsequently introduced to the ace's mother, the Countess Paolina Baracca, who one day said to me: Ferrari, why don't you put my son's rampant horse on your car? It will bring you luck"
I still have Baracca's photograph, with his parents dedication in which they entrust the horse to me. The horse was, and has remained, black; whilst I myself added the gold field, this being the color of Modena"